Operated by high level GPIB commands for easy and straightforward implementation in own programs or existing measurement set-ups. A typical system set-up is shown below. Fig. 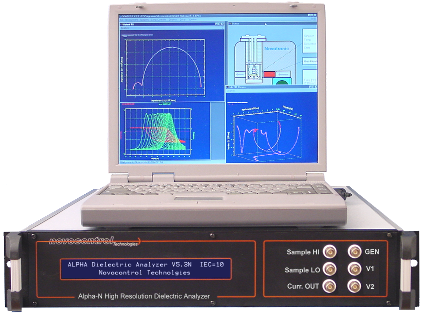 1: Typical Alpha analyzer system set-up. The active sample cell and WinDETA software are optional. Support of integrated high level commands for easy integration in own projects is in contrast to many older generation dielectric analysis systems. These systems are often made up as a combination of several devices. Typically a dielectric converter (or interface) containing a wide band electrometer amplifier and a set of reference capacitors is used as a front end for analog signal conditioning of the sample voltage and current. The conditioned signals are than applied to a gain phase analyzer (frequency response analyzer or lock-in amplifier) which measures amplitude and phase relations. Both devices (dielectric converter and analyzer) are connected to a computer which controls them by a customized system software supplied by the system manufacturer. This includes low level functions like selection of current and voltage ranges, selection of reference capacitors, evaluation of the measured impedance from the voltage a phase relations supplied by the analyzer, and system calibration. The disadvantage of this concept is that the system software, which usually exist as an executable file which can not be altered, is an integral system part and necessary for operation. Problems arise, if the system software can not be used. E.g. the user may not like it or may want to integrate the dielectric analysis system in an existing measurement set-up which includes other devices like e.g. temperature, pressure or process controllers which are not supported by the dielectric system software. In this case, the user would have to rebuild the internal low level control functions of the dielectric system which is in practice usually not possible. This problem does not exist with the Alpha analyzer as all low level functions are build in the internal firmware, which is controlled by high level easy to use GPIB commands easy to implement in own programs.